You’re ready to take relaxation to the next level at home, which is why you’re searching for the best weighted blankets for adults. Whether you need a blanket, or you simply want an alternative method for deep relaxation, you’re in luck, because we researched more than twenty blankets to bring you a comprehensive list of the top ten. Before you start shopping, check out the following specifications, which will act as a guide to help you choose the best heavy blanket to suit your individual needs. Size: If you’re new to the world of stress relief bedding, you’re probably wondering what size weighted blanket should you buy. We jotted down the dimensions of each option on our list to help you find the right size for your body. Weight: How heavy should a weighted blanket be? It depends on your personal preference, but generally, the heavier you are, the heavier your blanket should be. Check this spec for the weight of each blanket on the list. Color Option: Just because weighted blankets are used as therapeutic tools doesn’t mean they can’t also reflect your personal style! Many of the choice on our list come in a variety of colors or patterns. Check here for the details. Material: Blankets, including weighted blankets, should be soft. But what’s inside to make them so heavy? We’ll let you know what each blanket is made of, including its filling, to help you find the perfect pick for you or your loved one. Weight Capacity: If the blanket isn’t heavy enough, it might seem pointless. You want to be sure your blanket provides maximum stress relief. Check this spec to determine the suggested weight capacity for each option on the list. 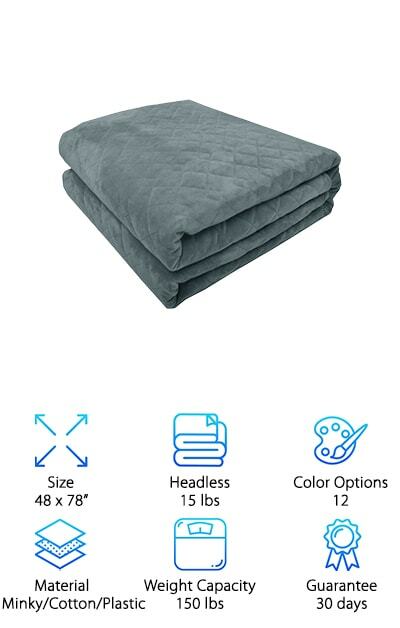 Guarantee: Weighted blankets tend to be a bit more expensive than their traditional counterparts. It’s nice to know you’re buying from a manufacturer who wants you to be satisfied. Check this spec to determine if your blanket comes with a warranty or a guarantee. You’re ready to check out our weighted blanket buying guide, now that you know what to look for. Each product on the list was carefully selected, so shop with confidence. If you’re in a hurry, check out our top and budget picks first, but don’t miss out on the other eight if you have time. Well, what are we waiting for? The sooner you make a decision, the sooner you’ll be experiencing the soothing benefits of a weighted blanket. Let’s get started! Bring on a sense of calm with our favorite pick for the top rated weighted blanket, the Harkla. Available in four different attractive colors and various sizes and weights for a custom fit to your style and needs, you’ll experience ultimate relaxation when you bring this blanket home. Whether you simply want enhanced relaxation, or you need it, this blanket will provide soothing pressure to help ground you and keep you satisfied and cozy. Snuggle up on the couch after a hard day with this weighted blanket or drape it over the top of your bed for extra sound sleep at night. Made from cotton and food grade poly pellets, the evenly-distributed, heavy feel of this blanket works to keep you safely cuddled and relaxed. It feels just like a normal blanket, but with added benefits! And it’s made from super soft minky fabric and has exterior raised dots for extra calming sensory effects. Best of all, the manufacturer offers a lifetime guarantee, making this purchase worth every penny! Our budget pick is a popular choice, boasting some of the most favorable weighted blanket reviews, and is available to you at a price that won’t make you flinch. The YnM is available in a variety of sizes and weights to custom fit you or your child. It is engineered to be ten percent of your body weight to reduce stress. Anything that reduces stress is a go in our book, but if you’re not sold yet, read on. The weighted inner layer is made from cotton and filled with hypoallergenic, odorless, and non-toxic sand pellets. The sand pellets are safe around kids and pets and feel more comfortable than plastic. The inner layer is also machine-washable on gentle, so if the blanket weathers an occasional spill or accident, it’s nothing to fret about. If you’re like us, you wash your sheets often, which is also fine with the YnM, as long as you’re sure to let it air dry to maintain its freshness and even weight. Constructed to simulate the feeling of being hugged, this option is perfect for soothing and calming your or your loved ones in distress or as a weighted blanket for sleep. 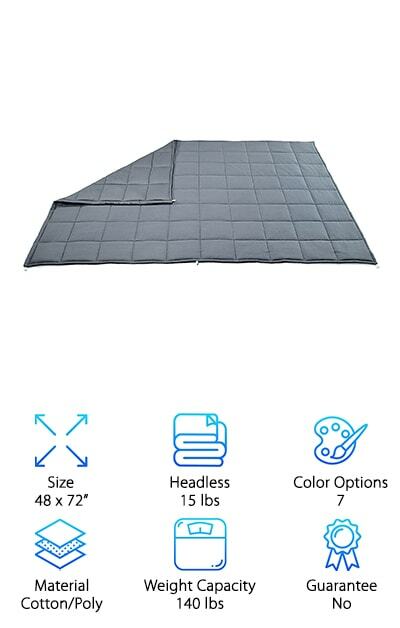 You’re looking for a premium weighted blanket for adults to help you take a load off. Look no further, because the Platinum Health is made with patented Evenflow technology to bring you the ultimate in comfort. Designed to provide even pressure reminiscent of a full body hug, this blanket is packed with CloudSoft Polyfill and Stardust microbeads-- the sound of which soothes us already. The luxurious outer cover is made from the softest minky polyester and features raised dots as an added sensory soother for fingers and hands that fidget. And if you value your privacy, you’ll appreciate the non-therapeutic look of this blanket, which completely conceals the weighting system inside the smooth cover. 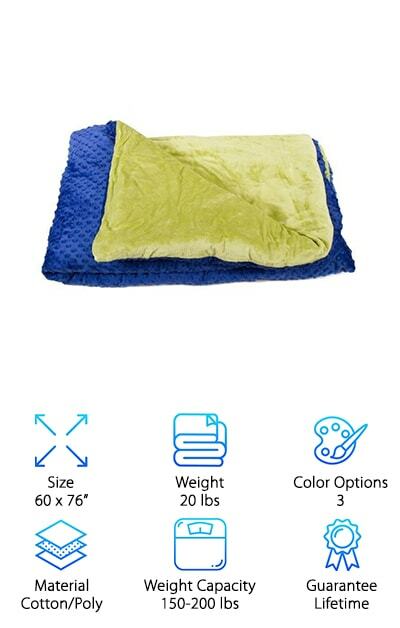 Choose from five different attractive color combinations and rest easy knowing this blanket is made to withstand the washing machine. Simply zip off the outer cover and wash on gentle cycle. Comfortable, soft, and filled with evenly distributed poly pellets, the ZonLi blanket is perfect for anyone searching for a little extra peace at bedtime or while relaxing on the couch. This 100 percent cotton heavy blanket is a great way to unwind after a stressful day. Get cozy and settle in for a relaxing movie or book, or head to bed and adorn yourself with the ZonLi for a peaceful, refreshing sleep. Enjoy 25 pounds worth of non-toxic poly pellets. Having a non-toxic filling means this blanket is safe for the whole family and won’t expose you, your loved ones, or pets to harmful chemicals. When it’s time for a cleaning, simply hand wash the ZonLi or run it through the washing machine on gentle cycle and dry flat after. If you have a minor spill, simply spot clean the blanket. If you’re ready for the embrace of a premium weighted blanket and solid colors are your style, you won’t want to miss this super soft option. 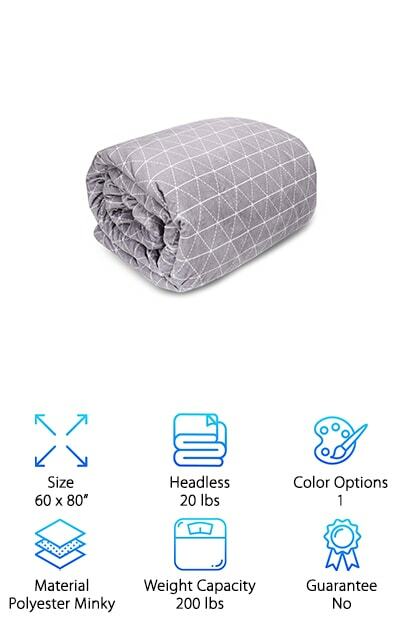 Looking for a queen size weighted blanket? Check out the Weighted Idea. It’s perfect to use as a bedspread, especially if more than one person enjoys the feel of a heavy blanket. There is nothing better than snuggling into your pillow at night and falling asleep under a calming, weighted blanket. Available in twelve different colors, you can easily find the perfect spread to match your sheets. You’ll love the soft feel of the minky polyester, done as a duvet cover in a classic and fashionable side sewn pattern. The inner portion is made from super soft cotton filled with non-toxic plastic pellets that are safe for the whole family. The hypoallergenic pellets are evenly distributed for maximum comfort. 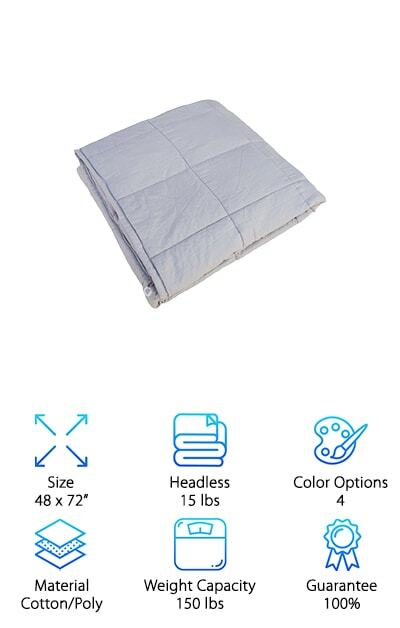 Available in a range of sizes, you should choose the Weighted Idea blanket that represents ten percent of your body weight for ultimate relaxation. And when you make Weighted Idea your choice, you get a 30 day guarantee from the manufacturer! Are you having trouble sleeping? Stressed? 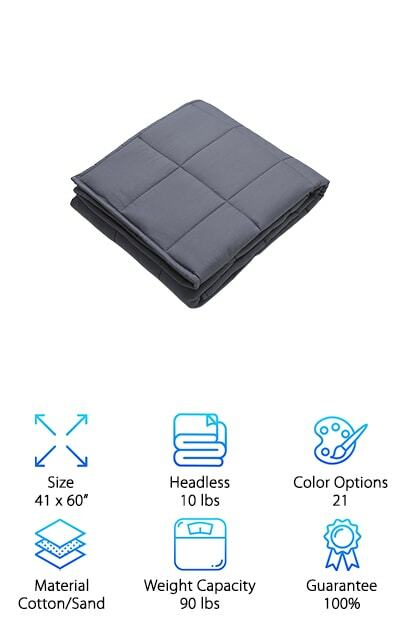 Check out the Kpblis Weighted Blanket. A popular choice, this best rated weighted blanket is a great way to soothe tired muscles and frazzled minds. Wind down after a long day with this soft, cozy option. You probably can’t make it to the spa every day, but a weighted blanket can be just as relaxing, as it feels like a full body hug. Available in a range of weights, the manufacturer recommends choosing an option between seven and twelve percent of your body weight, for optimal comfort and relaxation. Made with premium cotton that is breathable and natural, it’s filled with safe, hypoallergenic plastic poly pellets. This is great because it means the Kpblis is safe for the whole family! And it was sewn into small pieces, ensuring the pellets stay evenly distributed throughout the blanket. When you need to wash it, simply put it in the washer on gentle cycle. You might be still wondering: what is the best weighted blanket? 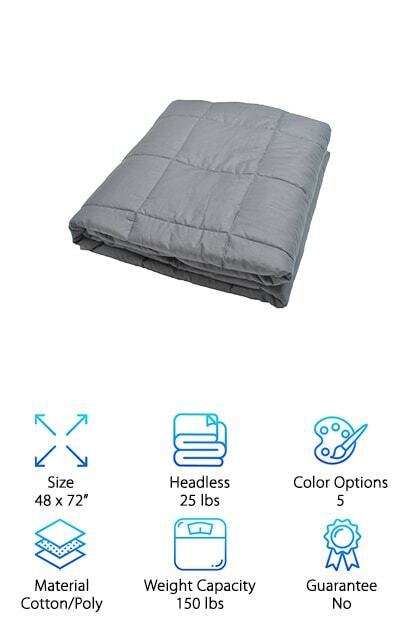 Boasting near perfect reviews and tons of fans, the Amy Garden Weighted Blanket is a soft, sleek heavy blanket available in seven colors and multiple weights. The inner portion is made from 100 percent breathable cotton and filled with odorless, non-toxic plastic poly pellets. The pellets are made to be safe for adults, children, and pets, so you never have to worry about harsh chemicals entering the environment in the event of the blanket becoming torn. Made in a range of sizes and weights, you can match the blanket to your preferences, so you end up with the most relaxing experience. Choose from a twin size weighted blanket to a king size weighted blanket or get them for the whole family! You’ll love cozying up with this soothing way to relax every night and may even have the best sleep of your life! Enjoy a hug fit for a Panda when you choose the Orange Panda Weighted Blanket. You’ll feel like you’re wrapping yourself in a bear hug as you snuggle into this super cozy, soft option. 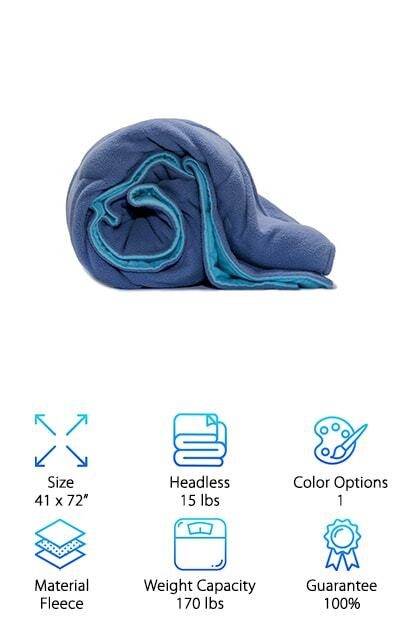 Designed specifically for tension relief and deep relaxation, everything about this blanket from its periwinkle color to its soft fleece material is designed to soothe and calm weary bodies and minds. Even though we have a number of great options on our list, the Orange Panda is unique when it comes to weighted blanket materials, because it features extra soft, warm fleece.The best part about this blanket? You can use it whenever you need a calming experience. Sleep with it or wear it around the house or on the couch to read, study, or watch television. When you’re ready to decompress, the Orange Panda is there to add even more relaxation. Who doesn’t need some stress relief after a long day? And best of all, it is machine-washable and fully returnable. You don’t have to compromise style when you’re looking for a therapeutic weighted blanket. The Rocabi is a gorgeous gray blanket featuring a fashionable light geometric pattern on the topside and soft raised dots over a plush minky material on the bottom side. Snuggle into your home decor when you choose the Rocabi Weighted Blanket. Enjoy the sleep of your life, as this cozy, cushiony blanket wraps itself around you and simulates the feeling of a real hug. Available in a range of sizes and weights, you can match the blanket to your body for the most relaxing experience possible or choose a large size perfect for two people over a queen or king size bed. This beautiful blanket feels like a slice of heaven whenever you need it, whether for medical reasons, meditation, or stress relief. And the outer cover is machine-washable, so it stays fresh and clean. 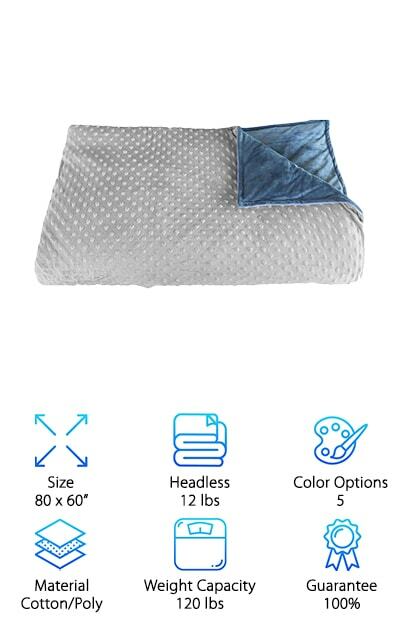 Instantly lower stress levels with the Snuzi Weighted Blanket. 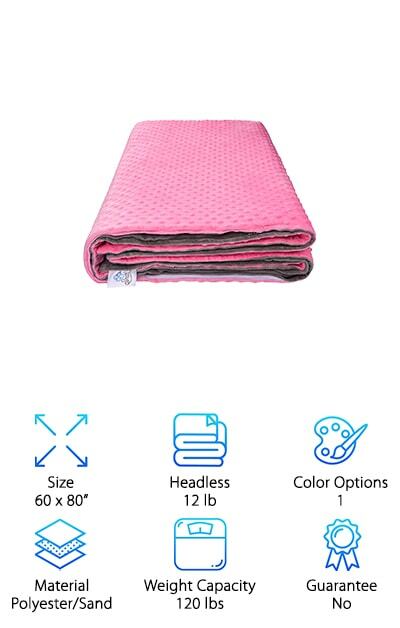 Perfect for anyone seeking deep relaxation or better sleep, this pink and gray blanket has all the right features to soothe and calm your body and mind. It works to stimulate pressure points throughout the body to effectively relax the wearer for a pleasant meditative or quiet experience or better sleep. Made from plush, minky fabric and equipped with sensory dots for added relief, it is filled with non-toxic, hypoallergenic sand pellets. The sand pellets feel more delicate than plastic pellets, adding to the safe and soothing feel of the blanket. The cover is easily washable, too, so it stays feeling and smelling fresh for the ultimate retreat out of the everyday stressors of life and into the world of a simulated hug. The Snuzi imitates the warmth and security of a hug, leaving you at ease and refreshed after a long day. This superstar blanket is the perfect way to wrap up our stellar list!